With the cost of a four year college education rapidly moving beyond the range of affordability for many families, this is an excellent time to take a close look as some well-paying occupations that don't require a degree. Fortunately, there are plenty of them -- here are ten. Military experience allows you to circumvent a college degree (an "air traffic management degree" from the Federal Aviation Administration is required otherwise). Median pay level: $108,040. The typical route into this field is through the military, generally as a pilot in the Air Force, Navy or Marines. Some pilots do have college degrees, but the basic preparation is hands on experience in the military. Median pay level: $92,060. In general, a high school diploma is the only requirement as far as education is concerned. Entry into the field is accomplished through the completion of an apprentice program with an employer. Median pay level: $70,910. An associate's degree in dental hygiene is typically required, but no bachelor's degree. State licensing is required, and the specifications for that varies from one state to another. Median pay level: $68,250. Education requirements can run from a high school diploma up to a college degree, followed by police academy training. Median pay level: $55,010. A high school diploma or equivalent will satisfy the education requirement. New entrants typically complete an apprenticeship program and some amount of technical school training is often involved. Most states require electricians to be licensed. Median pay level: $48,250. This field only requires a high school diploma, despite the fact that many people in the occupation do have four year degrees. Most of the training for the career is on-the-job training. Median pay level: $46,770. The education requirement is no greater than a high school diploma or equivalent. Like other fields on this list, plumbers learn the trade primarily through apprenticeships, though attendance at a technical school is also fairly common. Licensure is also required. Median pay level: $46,660. 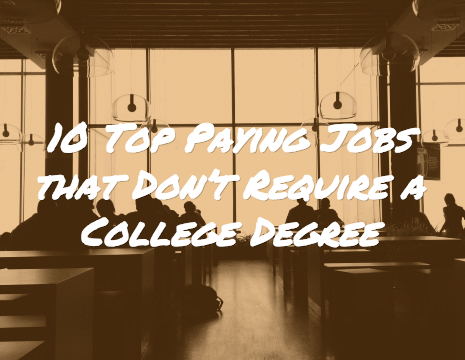 Some college is usually required, and typically an associates degree. On the job training is part of the entry as well. Median pay level: $46,260. Firefighters typically enter the occupation with a postsecondary non-degree award in fire science or a related discipline. In many jurisdictions, however, the entry-level education needed to become a firefighter is a high school diploma or equivalent. Most firefighters also must pass written and physical tests, complete a series of interviews, and hold an emergency medical technician (EMT) certification. All firefighters receive extensive training after being hired.